Deluxe Villa Rental in Siena, Villa Rental in Tuscany, Montalcino Villas for Rent. Villa San Giuseppe 5 on 5 1 reviews. An imposing doorway opens to a luminous hall which gives access to a living room divided into three parts, parted by archways, a cosy little study on the right, a large living room with a stone fireplace and French doors leading to a terrace with table and a gazebo. Last section of living room is occupied by a big dining table. The study has Internet access (no dsl line), a Tv Set, a Hi-Fi and a table dating back to the years of the 20th century. There is also a upright piano. An elegant kitchen is fully equipped with modern appliances, a dishwasher, a large oven, a fridge. Off the entrance hall there is a laundry room. On ground floor there is a bathroom (with no shower cubicle) and a double bedroom with a four-poster bed. Going up the travertine staircase with wrought iron banister, one reaches the first floor where there are four bedrooms all with wooden floors and three bathrooms. Bedrooms are spacious and have modern art paintings hanging on the walls, to continue the leitmotiv of the living room. Two out of four bedrooms have en-suite bathrooms in travertine marble, one with shower and one with bathtub. Another bedroom has a fireplace with access to the garden via a stone stairwell. Third bathroom has a shower cubicle. Throughout the house there are wood beamed ceilings, antique terracotta floors and precious curtains, the latter to assure some darkness to the rooms. The house is equipped with fans. Total surface of the villa is 300 sqm. 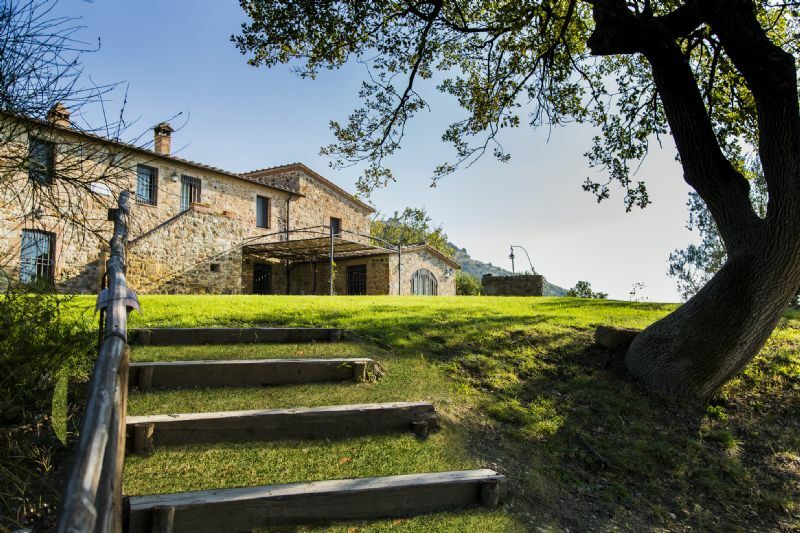 A comfortable villa restored by a famous Italian Architect whom used the typical Tuscan country materials along with a collection of many contemporary works of art. Set on a gentle hill sloping down towards the valleys of Mount Amiata (the highest peak in Tuscany), one gets to the villa by driving along a dirt road dotted with vineyards and yellow brooms. The garden is also plenty of scented lavender and rosemary bushes, it’s furnished with a patio for enjoying “al fresco” meals. Some steps down lead to the swimming pool area commanding superb views over the country side and surrounded by olive trees. Beside the pool a stone built BBQ with a rustic table. Please note that access road is a steep country road not suitable for low cars. Also, owner's dog lives in the garden. The villa exterior is in tufa stone while a small portion is plastered, no blinds or shutters on the windows, the architect decided to have as much light as possible coming through the windows. Dear Cinzia, We had a wonderful time. The villa is beautiful on the inside & the views are astounding. It is surrounded by the organic vineyard of the owner, Mrs Stella. She also owns the villa & she was very welcoming, bringing over a bottle of her delicious olive oil. And we spent a lovely afternoon tasting wine at her gorgeous cantina next door. We also enjoyed Fiorello -- the dog that lives outdoors between the villa & Stella's cantina. He was sweet, didn't bark much, & my kids adored him. Perhaps best of all is the location. There is a luxury spa being built nearby. The villa is close to Montalcino -- which is chock full of outstanding restaurants & was hosting a wine and jazz festival during our stay. And our most memorable dinner was at a tiny nearby hilltown called Saint Angelo in Colle.